On Thursday, April 24, Toronto-based floral designer Bruno Duarte will hold a workshop in floral arranging at Filoli. Photo courtesy of Bruno Duarte. This week, catch work by emerging playwrights at the Planet Earth New Play Festival, learn floral arranging from a master of the trade and see a film about how dance transformed the lives of people with Parkinson's disease. "There are no patients. There are only dancers." That's the tagline for "Capturing Grace," the 2014 film by David Iverson that follows a group of people with Parkinson's disease as they take part in a project with the acclaimed Mark Morris Dance Group to create a unique performance. Iverson himself was diagnosed with Parkinson's disease eight years ago and discovered the Dance for PD project as part of his personal research. His film comes to Stanford University this week as part of the San Francisco Dance Film Festival. Screenings will take place Friday, April 17, at 7 p.m. at Cubberley Auditorium (485 Lasuen Mall) and Saturday, April 18, at 1:30 p.m. at CEMEX Auditorium (641 Knight Way). Each screening will be followed by a panel discussion and Q&A with the filmmaker and others including David Leventhal, program director of Dance for PD. 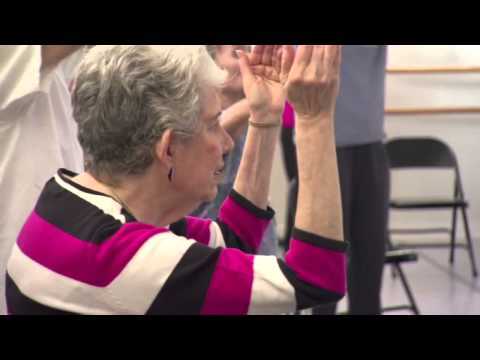 On Friday, April 17, from 1:15-2 p.m., there will be a presentation on the intersection of dance and Parkinson's disease at Pigott Theater in Memorial Auditorium. And on Saturday, April 18, Leventhal will hold a community dance class from 10-11:30 a.m., followed by a discussion and lunch. Tickets to the screenings are free for Stanford students and employees, $10 general admission. Go to sfdancefilmfest.org or call 844-567-3333. If floral arranging is your thing, you won't want to miss a chance to study with Bruno Duarte, Canada's celebrated floral artist and owner of Fresh Floral Creations. Raised on the Portuguese archipelago of Madeira, which holds a flower festival each spring, Duarte has a flair for creating stunning designs inspired by nature. Though he's now based in Toronto, Duarte travels internationally to design weddings and decor for major events. Among his biggest fans are Hollywood celebrities Renée Zellweger and Sir Elton John. The workshop takes place on Friday, April 24, from 9:30 a.m.-12:30 p.m. In an intimate classroom setting, Duarte will guide participants to work with flowers and other organic materials to create their own masterpieces. Some floral design experience is recommended. The fee for the workshop is $165 for Filoli members and $200 for nonmembers, who get access to Filoli for the day. Fees include all materials. Duarte will also give a lecture-demonstration on Thursday, April 23, from 10:30 a.m.-noon. The lecture is $50 for Filoli members, $60 for nonmembers. To register, go to filoli.org or call 650-364-8300, ext. 508. For more about Duarte, go to freshflorals.com. In honor of Earth Day, Planet Earth Arts presents an evening of original plays related to the environment. From the very real issue of climate change to visions of a future where resources are scarce, the Planet Earth New Play Festival features works by emerging playwrights whose aim is to inspire audiences to recognize environmental sustainability as the most critical issue of our era. Through realism and fantasy, comedy and rage, these plays promise to challenge as well as entertain. Among the works included in the festival are "Preapocalytica" by Erin Marie Panttaja, in which environmental crisis drives one character to madness, and "The Universe on Ice" by Maury Zeff, set in a frozen polar landscape populated by talking penguins and polar bears. The free shows will take place on Wednesday, April 22, at 7:30 p.m. at Stanford's Dinkelspiel Auditorium (471 Laguna Drive) and Friday, April 24, at 8 p.m. at Roble Theater (374 Santa Teresa St.). Wednesday's performance will be followed by a panel discussion featuring some of Stanford's leading scientists and researchers. To learn more, go to planeteartharts.org or call 510-677-2648.